Addiction has bedeviled mankind for as long we can think, and the negative effects of excessive indulgence have claimed many a life. Boozing wastes your liver. Smoking gives you lung cancer. Drugs ruin your life and that of your family. Fortunately, my vice is somewhat more benign. 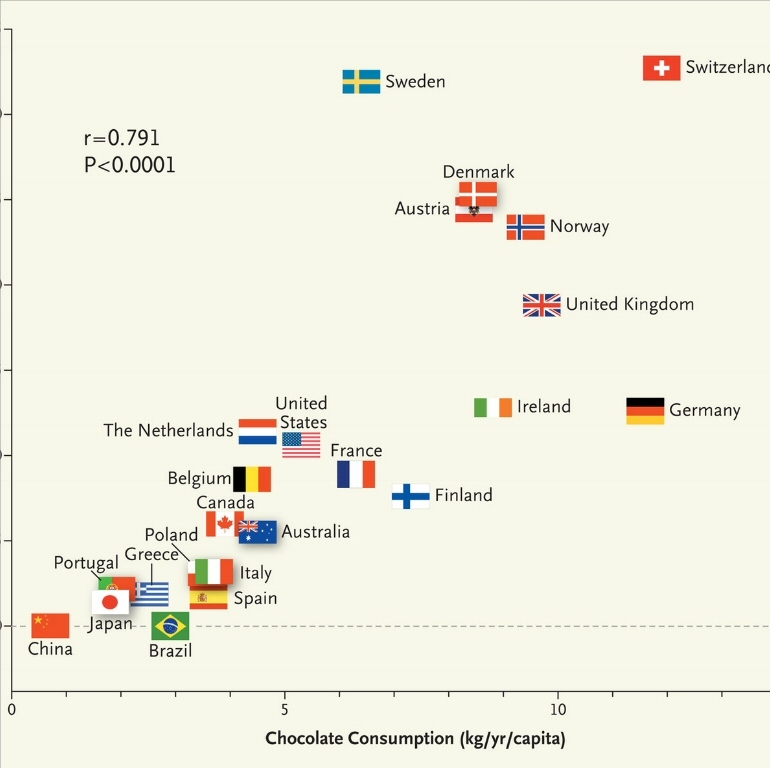 As it turns out, chocolate gives you Nobel Prizes. And perhaps a bit of megalomania, too. Still, I was thrilled when my friend recently sent me this article, which refers to a study published in the reputed New England Journal of Medicine. 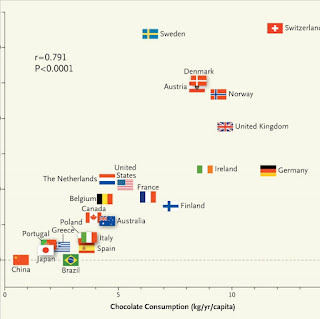 It compared per capita consumption of chocolate with the number of Nobel prizes won per inhabitant, and found a very strong correlation between the two. On the resulting graph, Switzerland ends up alone on the top right corner. It counts 31.5 Nobel laureates per 10M inhabitants, and its citizens each munch through a record 11.9kg of the prize-worthy sweet a year. QED, think the scientists. But they go further, and speculate on the positive impact chocolate has on cognitive function. Specific flavanols found in cocoa have been proven to boost brain function - in aging rats, anyways. The substance once reserved for Aztec emperors also produces a rush of happiness-inducing serotonins, although I'd like to think that it is really the sublime taste and texture that have long ago gotten me hooked. These days, chocolate goes anywhere I go, and anyone who has ever worked or studied with me will be aware of the strategic Schoggistängeli reserves in the locker. Deprive me of my after lunch coffee & choccy, and you make me antsy. Send me to a far-flung land, and after a few dry days, you will see me desperately wolf down the next best Mars bar. Yes, addictions can be brutal, but I'm feeling much better now. After all, to get the Swiss average consumption to 11.9kg, some brave citizens have to come in substantially above that amount. So hej there, Nobel Prize Committee. Where do I put in my name?